These snowy days remind me of the winters we had when we were kids. I can’t remember too many days though that the schools were closed unless it was a very big storm. Bet we would have liked that. We walked back and forth to school and attended from 9 to 4pm, going home for lunch at 12 and back to school for 1pm in both the Public Schools and High Schools. Weather wasn’t an issue most of the time. It was winter. One of my classmates had to walk from First Street between York and Bedford to CCVS on Fourth and Sydney.. …..that’s a bit of a hike on a snowy or even rainy day and back and forth for lunch also. She said that she often had wet mittens and snow in her boots. If we wanted to go skating, go to the movies, etc. in the winter, snowing or not, we walked. We were so used to it that it wasn’t a problem. All the kids did it and often had fun along the way meeting other kids. Sometimes on the way home we would climb up on a snow bank and slide down. Even threw a few snowballs probably!! Those were the days!! The East Front Public School is being renovated to become a retirement home in the future, which will be called the Riverfront Retirement Centre. My Mom had told me that she had attended the school many moons ago. She and another lady I knew said that they were together in a one-room classroom with different grades. They both liked it because it was a lot of fun. 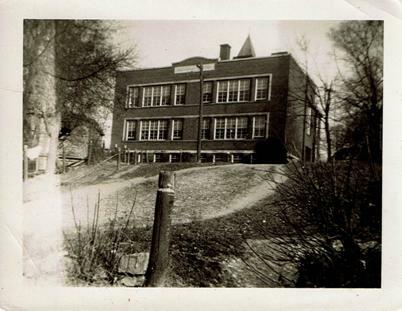 This is an old photo of the school from my Mother’s photo album. It looks as if it was taken from across the road. The year is unknown. My Mother’s parents apparently had a house and property just east of it somewhere before the former Glen Stor Dun Lodge. I took her to see a friend who was a patient at the Lodge one day. She pointed out the school to me where she had attended as a child and the family house with a big white veranda which was still there. In the mid 1990’s she was a patient at the Versa Care Nursing Home (now Heartwood) . One day they took some patients on a boat cruise of the St. Lawrence River. 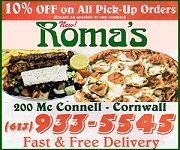 I went with my Mom who was in a wheelchair at the time. When we got to the boat she didn’t want to go on it. There were a couple of Elders of the Mormon Church helping on the cruise and they very gently reassured her that there was nothing to fear. We boarded and sailed east on the river. The young Elders were a great help to the residents and lots of fun. Coming back along the bank of the river westward, all of a sudden, she said, “That’s my home” as she saw the house with the big white veranda she had pointed out to me some years earlier. And then she saw the school and was so happy to tell those around her that she had attended the school as a child. It turned out to be a wonderful excursion for her that day. 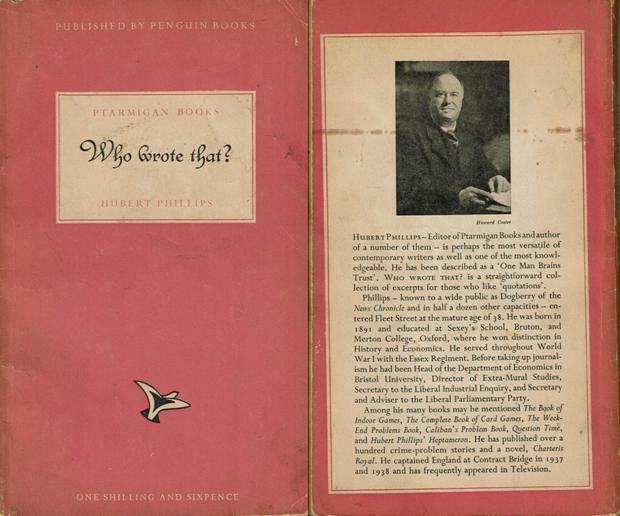 This book, “Who wrote that?” compiled by Hubert Phillips who was a well known author at the time. It was first published in 1948 by Penguin Books, Middlesex. It states that it was made and printed in Great Britain for Penguin Books Ltd. by Hunt, Barnard and Co., Ltd, London and Aylesbury. On the cover you can see that it cost one shilling and sixpence. I inherited this book in the late ’60’s. It states in the forward written in 1947 by Hubert Phillips that it is, ‘in a specialized sense, a Quiz”. It is, like watching the TV show “Jeopardy”. One line, ” If music be the food of love, play on”. I knew it but ..sooner or later I had to look it up. William Shakespeare: The Twelfth Night” which we would have taken in high school. Sometimes you might remember a few lines of the quote but not all of the authors or vice versa. There are 400 quotations and many familiar writers such as John Milton, Rudyard Kipling, sir Walter Raleigh, Abraham Lincoln, Alfred Lord Tennyson, Lewis Carroll and the Holy Bible. Lots of fun to pick up now and then and test the old memory cells. The book is still available on line. 1) In the old days they cooked in the kitchen with a big kettle that always hung over the fire. Every day they lit the fire and added things to the pot. Sometime they could obtain some pork which made them feel quite special. When visitors came over, they would hand their bacon to show it off. It was a sign of wealth that a man could ‘bring home the bacon’. They would cut off a little to share with the guests and would all sit around and ‘chew the fat’. In an article in the Ottawa Citizen, February 28th, 2018 was an article which I had kept about Canada’s first dementia village being constructed in 2019. I went on line recently and found several sites about the village. The Village Langley, Canada’s first ‘dementia village is estimated to be completed this spring and opened this summer. 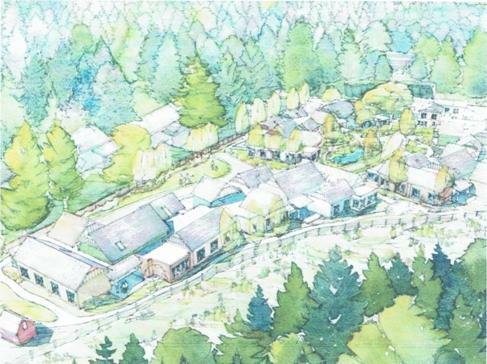 It is being constructed in Langley, B. C. and will be made up of 6 single storey cottages which will house 75 residents. Each cottage will consist of 12-13 private rooms, an open kitchen, dining room, livingroom with a fireside, sunroom and large activity room. There will be a community center named the Oakwood Community Centre and according to the sites, it will be located along the village Main Street. In the article it states that the residents will be able to get a haircut, shop, have a coffee, walk their dog and take part in other activities, even gardening, according to the Project leader, Elroy Jespersen. 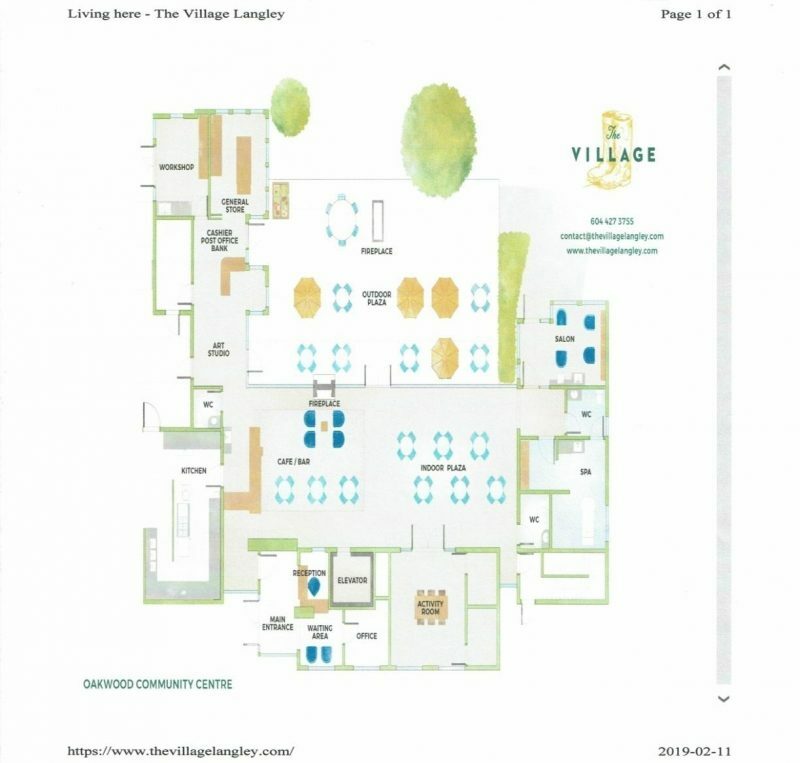 According to the Ottawa Citizen’s article of February 2018, (http://ottawacitizen.com/news/canada/canadas-first-dementia-village-is-set-to-open-its-doors…2018-03-07) another dementia village in Metro Vancouver is planned by the Providence Health Care on the St. Vincent ‘s Hospital site at Heather and West 33rd Streets. 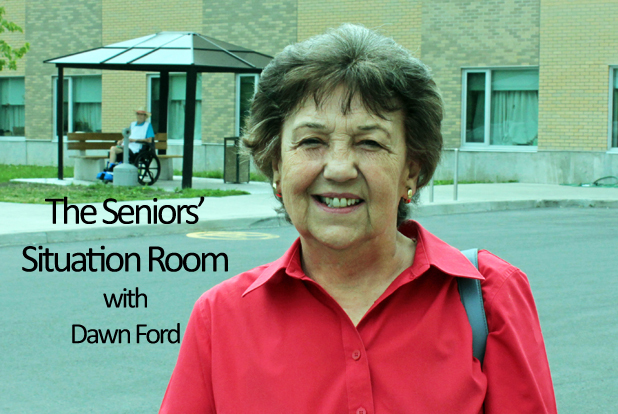 It is not expected to open for a few years but will house 300+ dementia residents. Hope we will hear more about this in the future. 2) Two cannibals are eating a clown. 3) An invisible couple got married. 4) A sandwich walks into a bar. 6) A jumper cable walks into a bar. dreaming I’m a wigwam or a tepee”.